Normally we work, rehearse, travel, sing concerts, meet business-partners and friends of the group without thinking too much about all the processes that are in play. Some of these processes might have to do with the fact, that we work in the cultural field and WANT to communicate, but some of the processes are probably also just human and can be recognised by anyone. We met this “anyone” at a charity event in Stockholm last year, and he happened to be a very nice person as well as a documentary-film producer - and his name is Carl. Initially Carl didn’t know what he was looking for (at least that’s what he told us), but he started visiting us while we were working, to see if he could put his finger on the thing, that sparked his curiosity. Ideally that’s how we want to work in The Real Group, so it felt natural to have an extra curious person around while rehearsing, traveling and singing concerts. Carl spent the summer meeting us in different locations, and he even followed us on tour to Japan, which is probably where he found the key to the door he was looking for. The Real Group Academy (TRGA) was asked to join a project to work for creating contact between young musicians and make way for future jobs. In 2016 Katarina Henryson and Caroline Berg from TRGA went to Riga for the first meeting with the Estonian partner from ERP management and festival organizers represented by Johannes and Inna Davidova Herman Braun Foundation, who manages the project in Latvia. There have been several meetings, workshops and concerts during the course of the two years and from The Real Group Academy´s point of view the project has been fun, fruitful and surprising. Two keywords that seem to be essential throughout the work have been ”communication and curiosity”. The Real Group Academy has brought ideas and methods about how to work non – hierarchically and to have positive reinforcement at the top of the agenda. To feel how the singers get empowered and how new doors can open a little is not only great for the music but it obviously creates a good environment for new contacts to be made. Peder and Katarina from The Real Group Academy held a workshop in Riga and another one in Stockholm. 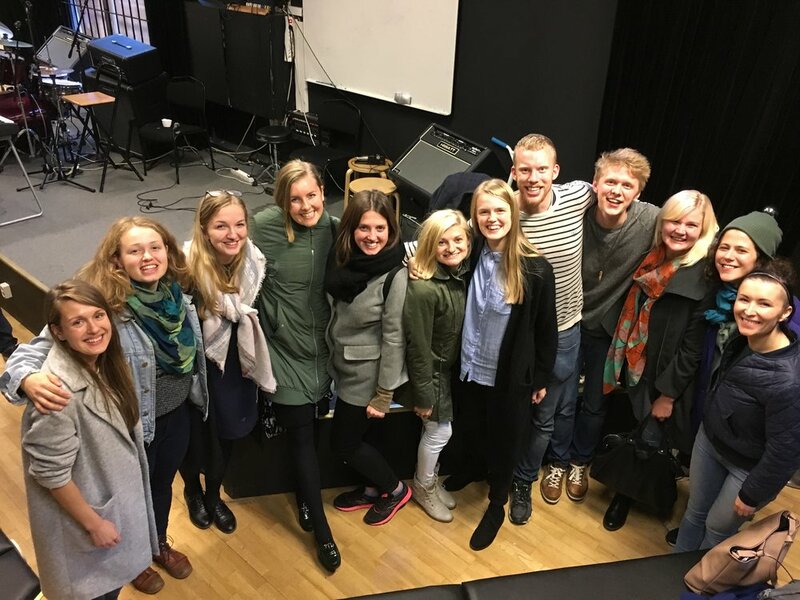 The latter had among others, two young Swedish vocal groups participate for full day workshops. ”Latvian Voices” both as workshop participants and to perform. It was also possible include pedagogues in the Stockholm session which was a valuable addition although the education and contact between young musicians were at the centre of the project. The improvisation group Format, formed by students from Södra Latin school of Music and took part in 2 trips to Riga. The contact between Latvian Voices and Format - 2 female vocal groups at different points in their career and development- contributed with musical energy that we could only dream of! Katarina had the great opportunity to meet with five Latvian incredibly experienced pedagogues and hold a workshop on ensemble improvisation. It is very valuable for The Real Group Academy to concretely be able to make the connections and act on them the ay we were able to do it through this project. Thank you EU and Thank you Inna Davidova form Herman Braun Foundation for your persistence, trust and your ambition to make paths for music to happen. Wow, what a weekend we had in Fossano, Italy! It was an honor and our absolute pleasure to be part of the Vocalmente Festival 2018. Not only did we have a love-filled concert that even the rain couldn't spoil (though it tried several times), but also our baritone Morten was part of the educational team and spent all four days of the festival meeting with already established groups and individual singers in workshops, sharing experience and thoughts about singing, listening and life in general. A huge Thank You to everyone who makes this festival possible, every singer that was there and our fantastic audience! Ciao till next time! A new The Real Group album out now! This summer we have released a joined album with the Hessen State Youth Jazz Orchestra "Kicks & Sticks" conducted by Wolfgang Diefenbach. 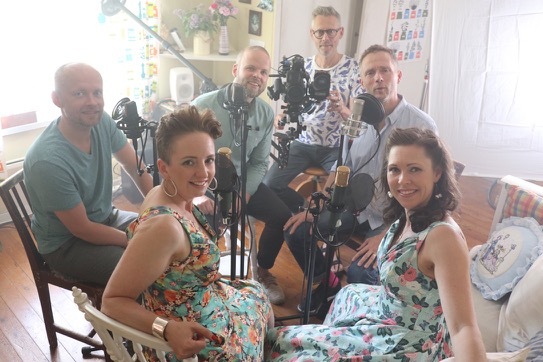 The album is called Friendship and contains 11 songs arranged for the group and the big band by various talented composers and arrangers including our own Anders Edenroth and Morten Vinther. Of course, we are working on putting the album out on Spotify and other music platforms. Under hösten satsar Bilda på en körworkshop-turné tillsammans med sångaren Peder Karlsson. Under vecka 41 och 43 gästar han åtta orter runtom i landet med workshopen Medskapande körsång. Olika rytm-, klang- och intonationsövningar lärs ut på gehör med sångaren i fokus, baserat på ett lekfullt utforskande av olika röster och uttryck. Här finns möjlighet för alla körsångare och körledare att på ett lekfullt sätt utforska röst, rytm och rörelse. Alla är välkomna och deltar utifrån sin nivå. Är du intresserad att delta? Kolla gärna in We Are Voice Körsommar där du kan sjunga några av våra arrangemang och få tips om aktiviteter under semestern. We are excited to tour Sweden a little more this summer before we are going on a longer tour to Japan and China. However before we fly east we're looking forward to a concert at a castle in Germany, a day of workshopping with Norwegian singers in Nittedal and a re-visit to the wonderful Vocalmente festival in Italy. 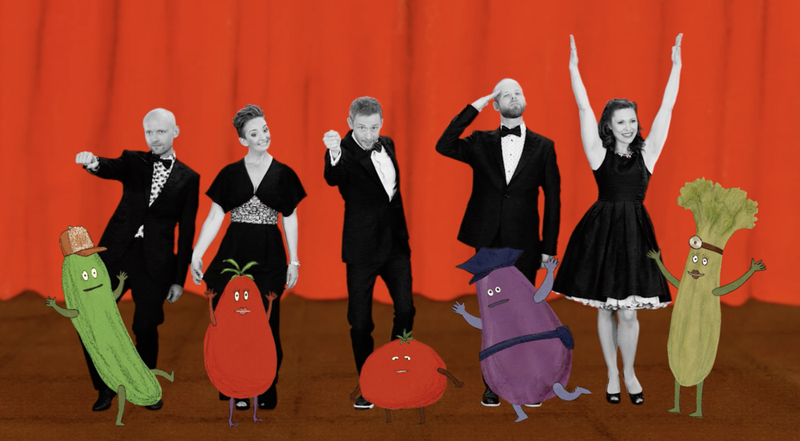 We hope you like our new video "Catch Up, Ketchup!" - it available on here on our page OR via the youtube link below.